China's factory activity is slumping adding to growth concerns. 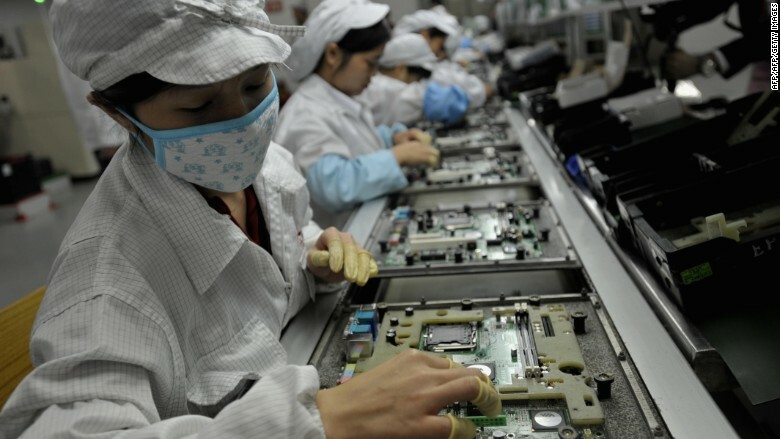 China's factory activity slumped in March, dropping to its lowest pace in 11 months, according to an early gauge in the country's all-important manufacturing sector. HSBC said its "flash" measure of sentiment among manufacturing purchasing managers fell to 49.2 this month. The slide from the index's final reading of 50.7 in February was worse than economists had expected. Any number below 50 represents a contraction. This isn't good news for China -- the world's second-largest economy -- and will fuel concerns that economic growth in the first quarter was likely ho-hum. The slowdown is putting even more pressure on the government to take action -- amid ambitious economic reform plans -- in order to reach its own 7% growth target for the year. Today's economic data "is the latest in a string of disappointing data out of China and strengthens our view that the economy likely slowed sharply in the first quarter," said Julian Evans-Pritchard of Capital Economics. "We expect policymakers to respond by stepping up measures to support growth." Some possible government stimulus measures could include stepping up fiscal spending, alongside further cuts to the required reserve ratio and benchmark interest rates, he wrote in a research note. China posted its weakest growth in 24 years last year, clocking in 7.4% GDP growth for 2014, according to the National Bureau of Statistics. That was below the government's 7.5% goal, and was the slowest since 1990. GDP growth in China remains the most comprehensive gauge of the country's economic health -- an important number to watch as the government works to shift to consumption-driven growth. China averaged economic expansion of around 10% a year over the past three decades, pushing it up the list of biggest economies and boosting household wealth. But now, the pace of growth is languishing -- China recorded GDP growth of 7.7% in 2012 and 2013, a marked slowdown from 9.3% in 2011 and 10.5% in 2010. Markets in Shanghai slipped more than 1% in Tuesday morning trading after the data release, before rebounding to end the day little changed.